Samsung Electronics, the global TV industry leader, is elevating its presence at IFA 2016 with a special exhibition designed by a team of rising German artists. 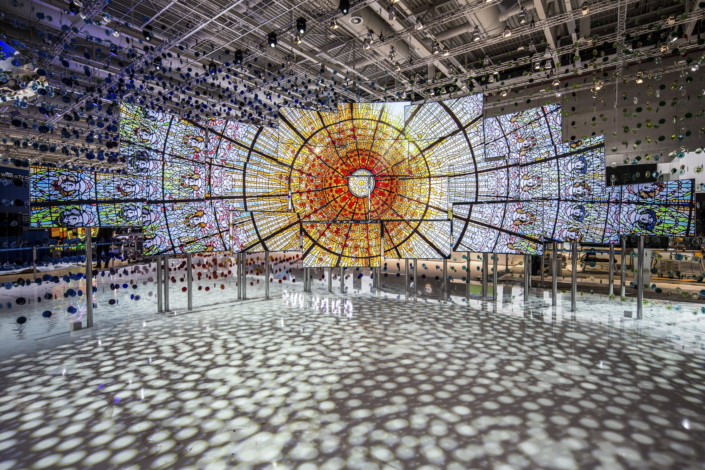 The installation, entitled The Origin of Quantum Dot, showcases the beauty of Samsung’s SUHD TVs with Quantum dot display, while incorporating video, lighting and musical elements. The Rethink Zone, which is located in the center of the Samsung booth at IFA, introduces innovative products with convenient, functional features to make day-to-day life easier for consumers. Additionally, the zone will highlight how these products have impacted the home entertainment and appliance industries. Visitors will have an opportunity to learn more about Samsung’s SUHD TV with Quantum dot, the Serif TV and more. At the Quantum dot Experience Zone, which is located at the entrance of the Samsung booth at IFA, visitors are invited to learn more about the past, present and future of Quantum dot. This will include more information on its durability, size and material, and color efficiency, as well as its future uses. Visitors will also be greeted by 45 SUHD TV models, ranging from 65- to 78-inches in size, as part of The Origin of Quantum Dot art installation. In the Smart TV Zone, visitors can preview TV PLUS, the Video-on-Demand service scheduled for release in the United States during the fourth quarter, and Europe in 2017. Samsung previously launched TV PLUS in Thailand, Vietnam and Korea. In addition to TV PLUS, several of Samsung’s content partners, including 20th Century Fox, Warner Brothers, Amazon and Netflix, will introduce their HDR and UHD services. Various games that can be played without a console will be introduced as well. Gamefly, a streaming game service, is launching new games dedicated for Samsung Smart TVs every month, and at the upcoming IFA, visitors will be able to enjoy 2K’s Borderlands and Bioshock at the site. The AV Zone will feature a complete 4K entertainment experience, equipped with Samsung SUHD TVs, Ultra HD Blu-ray player (UBD-K8500) and the HW-K950 Soundbar featuring Dolby Atmos® technology. Visitors will have the opportunity to experience cinematic experience and harmony of Samsung’s 4K home entertainment devices. Samsung Electronics’ booth will be open at Level 2 of CityCube Berlin from September 2 through 7 for IFA 2016.